← Are you on the Electoral Roll? We had a fun time yesterday morning in our all-age service, and we learned a lot too, about the lives of cocoa bean farmers, how hard they have to work to make a living, and why it is so important to support them by buying fairly-traded chocolate. 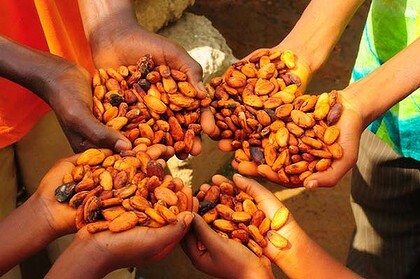 We sat round tables, adults and children together, and played a variation on the chocolate game – a very interesting exercise that illustrates the difficulties that the cocoa bean farmers have to grapple with. I really liked the opportunity we had to spend time as a church family, both learning and having fun. This entry was posted in Events, Food and tagged chocolate, cocoa, Fair Trade. Bookmark the permalink.